I have been incredibly fortunate to have met, whether in the flesh or by telephone conversation or letter many veterans of the Burma campaign. These meetings have given me a wealth of first hand knowledge and a unique understanding of how things really were back in 1942-45. I have also been overwhelmed by the generosity and kind heartedness of many families who share my experience of having a Chindit as their husband, brother, father, Grandfather or Great Grandfather. On this page I aim to show you where the information for operation Longcloth was to be found. Opposite (left) is a photo of the National Archives, Kew, London. Without doubt, in my experience and journey the greatest source of information available when searching out the men of Chindit 1. (Apart from this website of course). General overviews on the Burma Campaign. Burma-The Longest War, Louis Allen (image, right). The absolute bible for the campaign in my opinion. 'A Hell of a Licking' Retreat from Burma, James Lunt. Wavell, Supreme Commander, John Connell. Defeat into Victory, William Slim. Forgotton Voices of Burma, Julian Thompson. The Story of Burma, F. Tennyson Jesse. (a history of the Burmese nation). Burma under the Japanese, Thakin Nu. Crisis Fleeting, James H. Stone. (a medical report for the campaign). Knights of Bushido, Lord Russell of Liverpool. 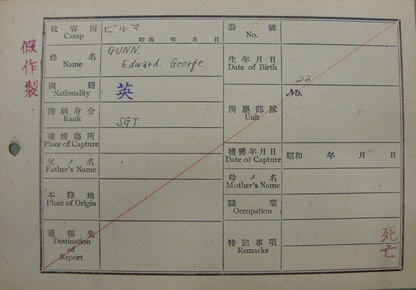 (report on the War Crimes and trials of the Japanese). Tales of Japanese Soldiers, John Nunneley and Kazuo Tamayama. Beyond the Chindwin, Bernard Fergusson. Across the Threshold of Battle, Harold James. Safer than the Known Way, Ian MacHorton. With Wingate in Burma, David Halley. Return via Rangoon, Philip Stibbe. Wingate's Lost Brigade, Philip Chinnery. (Pictured left). March or Die, Philip Chinnery. Wingate's Phantom Army, W.G. Burchett. War in the Wilderness, Tony Redding. Wingate, in Peace and War, Derek Tulloch. There was a Man of Genius, Alice Ivy Hay. 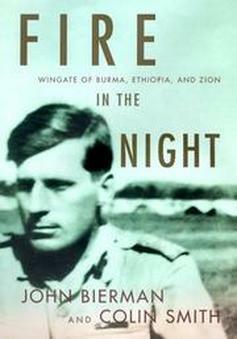 Fire in the Night, John Bierman and Colin Smith. (pictured right). To Be a Chindit, Phil Sharpe. Make for the Hills, Robert Thompson. Prisoners of Hope, Mike Calvert. The Gurkhas, Harold James and Denis Shell-Small. The Road Past Mandalay, John Masters. The Happy Warrior, Jan Rippin. The story of Major Eric Stephenson (3/2 GR). No Surrender in Burma, Fred C. Goode. Wavell, Portrait of a Soldier. The Trumpet in the Hall. Black Watch and the King's Enemies. Jungle Jungle Little Chindit, Jon Musgrave-Wood and Patrick Boyle. The History of 194 Squadron, Douglas Williams. First in the Indian Skies, a History of 31 Squadron, Norman L.R. Franks. March on Delhi, A.J. Barker. Out of the Blue, Terence O'Brien. The Story of the Kings Regiment (Liverpool) 1914-1948, J.J. Burke-Gaffney. Dekho! magazine, the journal of the Burma Star Association. (see image left). Back issues I received courtesy of Yvonne Baxter. 'Rangoon Ramblings', the newsletter for the ex-POW's of Rangoon Jail, edited by Karnig and Diane Thomasian. Here is a list of the main documents, mostly War Diaries that have helped unearth the story of operation Longcloth. Each and everyone has been found at the National Archives, but some copies do exist elsewhere, for example, some of the 13th King's diaries can be found at the Museum of Liverpool. WO166/4357-diary for 1940/41, at home in UK. WO172/866-diary for 1942, voyage to India and training. WO172/2516-diary for Operation Longcloth in 1943. WO172/2517-diary for Column 5 in 1943. (see image left). WO172/2518-diary for Column 7 in 1943. WO172/2519-diary for Column 8 in 1943. WO172/7638-diary for 1944/45 in India. WO361/442-Missing in Action reports for 13th Kings in 1943. WO172/2654-diary for 2nd Burma Rifles in 1943. (see photo above, taken at Dehra Dun in 1944, many of these men took part in 1943. Photo courtesy of Mark Steevens). WO172/611-diary for 142 Commando in 1942. WO172/5015-diary for 3/2 Gurkha Rifles 1944. WO172/2107-diary for 77th Indian Infantry Brigade (unit name for entire Longcloth force). WO361/436-Missing in Action reports for 77th Indian Infantry Brigade. WO177/2087-diary of 19th Casualty Clearing Station, Imphal. It was here that the returning Chindits received medical attention in 1943. WO177/2268-diary of the HMHS Karapara. The hospital ship that brought the liberated POW's from Rangoon Jail back to Calcutta. WO345/1-58. Japanese Index Cards for POW's held 1942-45. (See example left of Sergeant Gunn of column 5, who was promoted twice on operation Longcloth and could well have survived, but chose to remain with his exhausted and struggling platoon. It cost him his life). WO344/361-410. Liberation Questionnaire's from POW's of the Japanese. 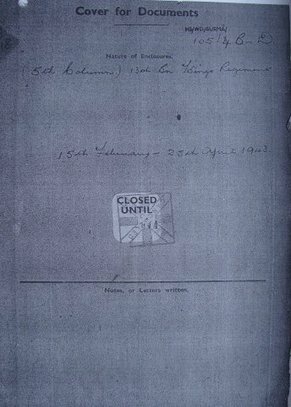 AIR38/80-liberation report on the prisoners from Rangoon Jail. The following links are for some of the main establishments, museums or websites that I have used in researching the Longcloth story. Most of these will be basic starting points for most military research and investigation. Army MOD website, enquiries into personnel service records. The Gurkha Museum, Winchester. The Imperial War Museum, London. (Pictured above). The British Library. The Liddell Hart Centre. ​You may not be aware, but sadly 2015 was the last year of the Chindit Old Comrades Association or COCA as it was more commonly known. This organisation has been in existence since the late 1940's and has kept the name and the legend of the Chindits alive ever since. The association was based in Wolverhampton and held an annual dinner in June, as well as organising other events for veterans and their families throughout the year. Acting alongside COCA, there has been an organisation called 'The Friends of the Chindits'. The aim of the 'Friends' was to provide continuity and support for The Old Comrades, as it looked to maintain the legacy of the Chindit name and to promote their story to a wider audience. This spring (2016), both these organisations have been succeeded by the newly formed 'Chindit Society'. To protect and maintain the legacy and good name of the Chindits and their great deeds during the Burma Campaign. To carry that name forward into the public domain, through presentations and education. To gather together and keep safe Chindit writings, memoirs and other treasures for the benefit of future generations. To assist families and other interested parties in seeking out the history of their Chindit relative or loved one. Wherever possible, to ensure the continued well being of all our Chindit veterans. With this in mind, The Chindit Society warmly welcomes any families with Chindit, or possible Chindit connections to join our group. As well as carrying out the above objectives, we will be looking to produce at least two Society newsletters each year and publishing our own website with the aim of bringing together in one place, the story of the Chindits and their unique contribution to the Burma Campaign. Or alternatively download the membership form shown below. Below are some general photographs showing The Chindit Old Comrades Association's activities over the years. Firstly, the COCA Annual dinner programme for 2011, next to this the programme for the opening ceremony of the Chindit Memorial in 1990. The memorial is to be found on the Victorian Embankment, London. The next two images are, the personal invite to attend the unveiling of the Chindit Memorial, as sent by the then President, Brigadier Walter Purcell Scott and lastly, a photograph of the Memorial itself, image courtesy of Eddie Chandler. The Chindit Memorial, Victorian Embankment, London. Copyright © Steve Fogden 2011.